Steven Chabinsky serves as senior vice president of legal affairs and chief risk officer for CrowdStrike, where he advises the company on cyber, legal, privacy and reputation-related issues involving product development and execution. Before joining the company, he served as deputy assistant director in the FBI‘s cyber division and led investigations, intelligence analysis, policy developments and outreach related to cyber attack, cyber espionage, online child exploitation and Internet fraud. He has also served as chief of the FBI’s cyber intelligence section, where he organized and led the FBI’s analysis and reporting on terrorism, foreign intelligence and criminal matters related to cyber threats. According to CrowdStrike, Chabinsky helped formulate the Homeland Security Act of 2002, the National Strategy to Secure Cyberspace in 2003 and National Security Presidential Directive 54 in 2008, which included the Comprehensive National Cybersecurity Initiative. Between 2007 and 2009, Mr. Chabinsky served in the Office of the Director of National Intelligence in positions such as acting assistant deputy director of national intelligence for cyber, chairman of the National Cyber Study Group, and director of the Joint Interagency Cyber Task Force. At ODNI, he was responsible for helping lead national intelligence efforts to coordinate, monitor and provide recommendations to the president on cyber strategy. Chabinsky first joined the FBI in 1995 as an attorney in the Office of the General Counsel and initially focused on employment law and personnel litigation. 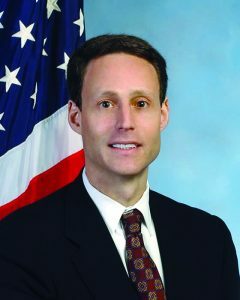 In 1998, he served as principal legal adviser to the National Infrastructure Protection Center and then in 2002 he assumed the senior counsel role in the FBI’s cyber division. The FBI says he helped expand the InfraGard program from 200 unvetted members in three cities to 500,000 vetted members in more than 85 cities. InfraGard is a critical infrastructure partnership between the private sector, academia and government agencies. Between 2002 and 2003, Chabinsky served in the White House’s transition planning office to help create the Department of Homeland Security and oversaw legal matters associated with starting the department’s information analysis and infrastructure protection directorate. Before joining the FBI, he served as an associate attorney in the New York City-based law firm Simpson Thacher & Bartlett, where he tried cases involving insurance and reinsurance contract disputes, class action product liability and internal investigations. He also clerked for Judge Dennis G. Jacobs at the U.S. Second Circuit Court of Appeals and holds both undergraduate and law degrees with honors from Duke University. Chabinsky is also a recipient of the National Security Agency’s bronze medallion for inspired leadership, the ODNI’s bronze medallion for ollection and the President’s Rank Award of Meritorious Executive award.